A seven-hour standoff in Dover, New Hampshire, ended peacefully after the suspect surrendered to police. But it was a tense and chaotic morning in the apartment complex where it all happened. NBC Boston spoke with a woman who came face to face with the suspect when he broke into her apartment. She managed to escape, but was too scared to go on camera, her neighbors however describe a chaotic morning. “It looked like a warzone at the time,” said Nicholas Waldie. 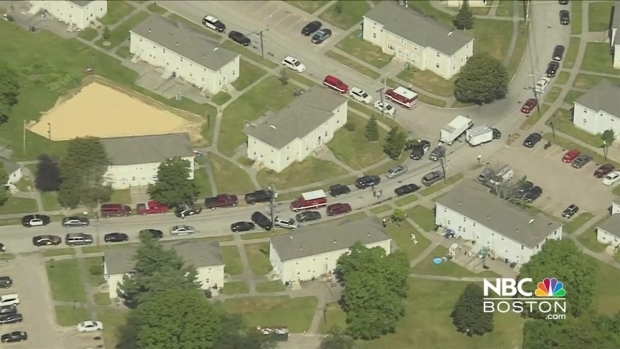 Police in Dover, New Hampshire, are responding to a standoff in the area of Pleasant View Circle and Mineral Park Drive. People who live in the Whittier Falls apartment complex woke up to SWAT teams in their backyard Friday morning. “Just cops everywhere,” said Beth Bickford. “Running up and down the road with guns and rifles,” Waldie said. Police were banging on doors to get families out of harm’s way. “It was terrifying,” said Becky Thompson. By 6 a.m., police say a man had stolen a high-powered rifle from a nearby residence. “We believe it was an AR15 rifle,” said Dover Chief Anthony Colarusso. He says the suspect then broke in to a Whittier Falls apartment building. Negotiators connected with him on a cell phone. “He would refuse to come out, he would hang up on us, reconnect, and he would hang up on us,” Colarusso explained. So, police started using flashbangs and teargas. By noon, NBC Boston captured the moment the man surrendered. From a different angle captured by a neighbor, you can hear their relief. “Oh, thank God,” the woman says on her cellphone video. “There was a big potential for violence, people getting hurt,” said neighbor Denise Thompson. The suspect is Ricky Nelson, Jr. His ex-girlfriend lives in the apartment complex and tells us Nelson was distraught over their recent breakup. With that in mind, neighbors are even more thankful for the officers who protected them. Colarusso says Nelson is a convicted felon. He’s charged with burglary, theft of firearm, and felon in possession of firearm. He’s being held pending his arraignment on Monday.